1914. Scotts became licensees for FIAT. 1914. 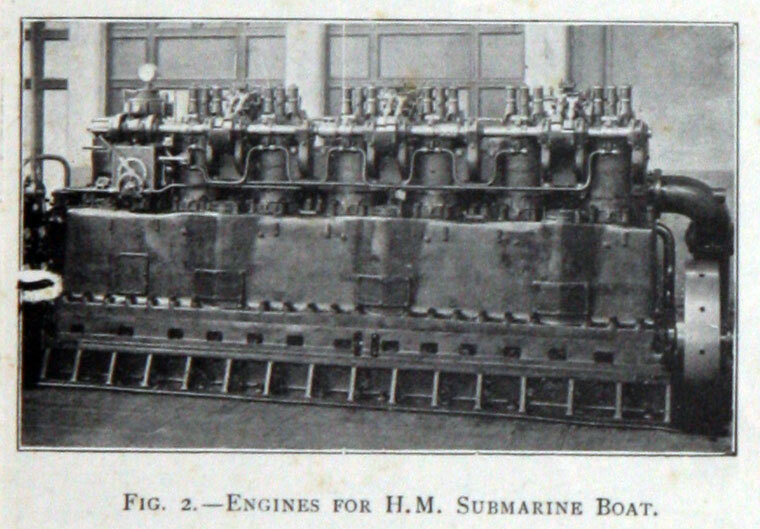 Engine built for H.M. submarine boat. 1914. 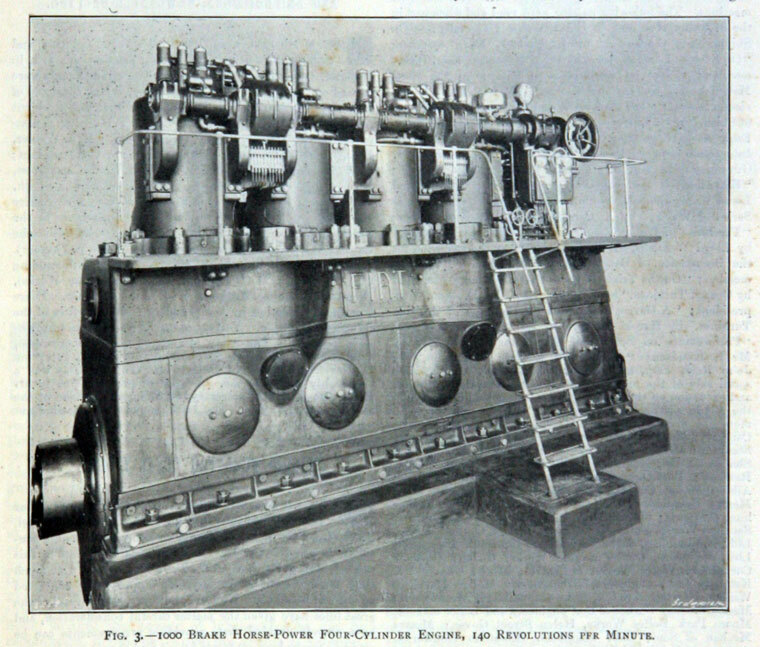 Six-cylinder two stroke cycle reversible engine for submarine. 1928. Twin screw cargo motor vessel MV Eurybates. 1928. 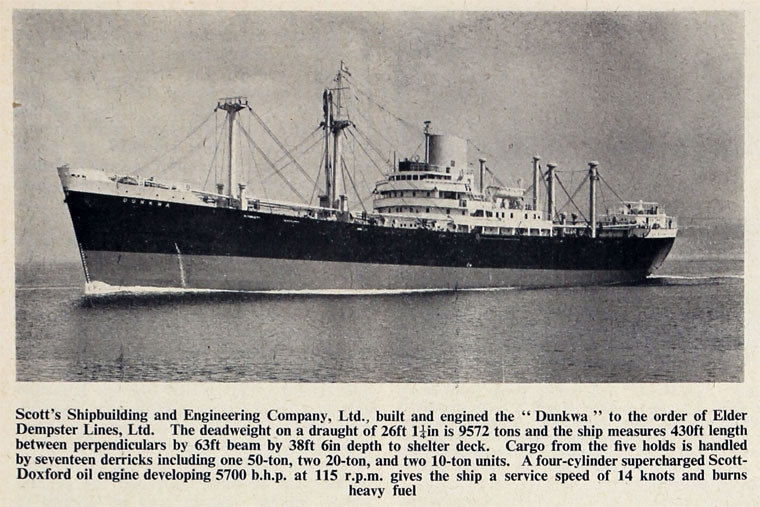 Diesel electrically propelled oil tanker Brunswick. 1952. 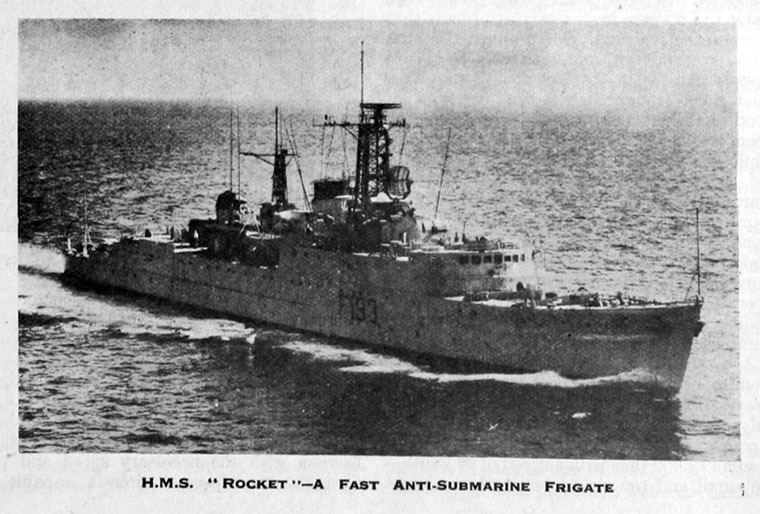 HMS Rocket - Anti-Submarine Frigate. 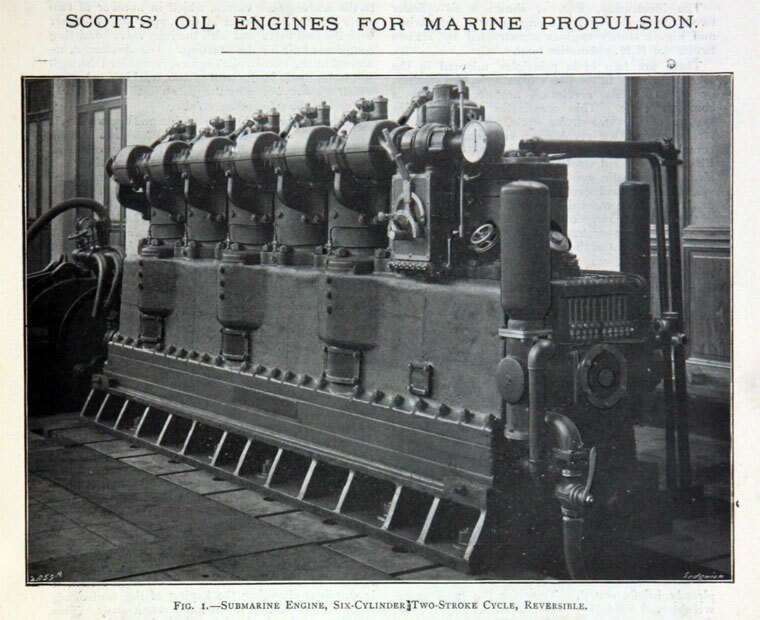 Scotts' Shipbuilding and Engineering Company often referred to simply as Scotts, were a British shipbuilding company based in Greenock, Scotland, on the River Clyde. 1711 A shipyard was established by John Scott, and initially built small fishing craft. 1851 After a family feud, Charles Scott left the business and set up his own yard Scott and Co at Cartsdyke. 1852 After completing his apprenticeship, John Scott (1830-1903), eldest son of Charles Scott, became a partner. 1880s Throughout the 1800s, a number of steamers were made for different companies. Scotts' were also technical advisers to John Swire and became involved with major construction work for Taikoo Dockyard and Engineering Co. in Hong Kong. This advisory relationship between Scotts' and Swire lasted until the 1880s. 1883 They took over Robert Steele and Sons. The yards also have a history of building warships, Chinese river steamers and naval construction. 1899 Private company Scott and Co.
1900 Incorporated as a limited company. 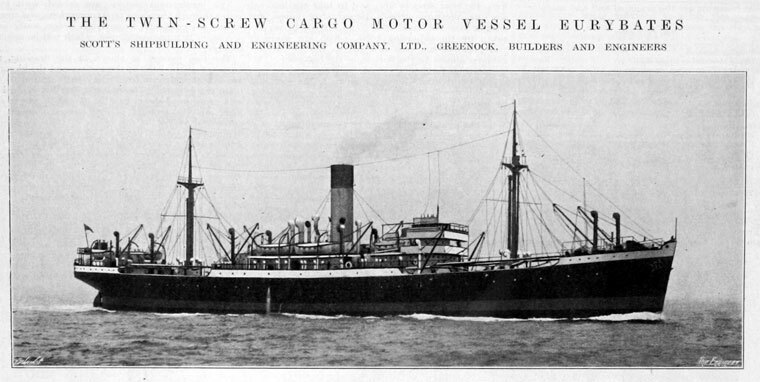 1904 Became Scotts Shipbuilding and Engineering Co when the engine works, Greenock Foundry Co, was swallowed up. 1900s The company's output was prodigious with over 40 ships built between 1895 and 1905. Notably, the yard was known for it beautiful passenger/cargo liners and steam yachts. The company made over 24 luxurious yachts for the wealthy between 1876 and 1908. 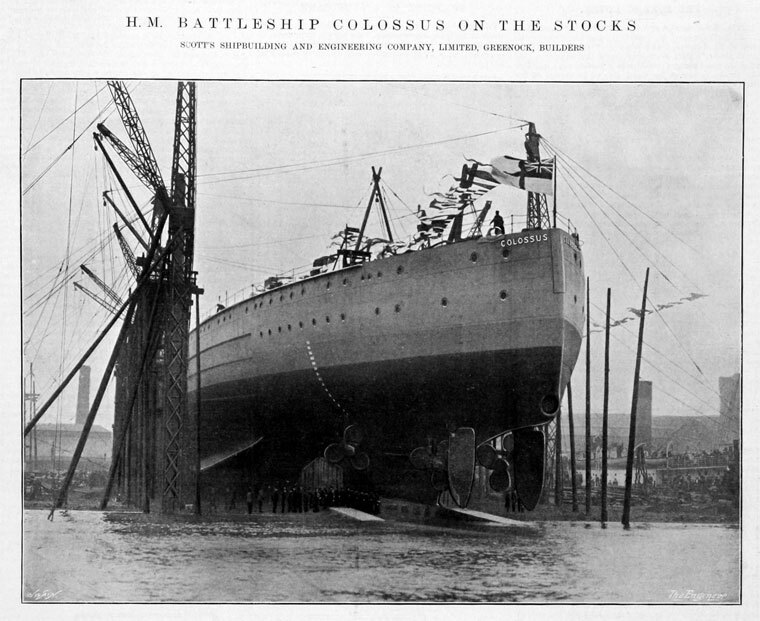 The yard also continued building tramps for the Clyde Shipping Co and tankers for the Anglo-American Oil Co.
WWI The yard already had a long history of naval work which was longer than any other Clyde yard, and had already made Dreadnought battleships before the outbreak of war. It should also be noted that the company had been experimenting with submarine designs too, and this held them in good stead with the Admiralty who ordered a number of different models during the war. The yard also made high speed light cruisers, torpedo boat destroyers three sloops and a monitor. 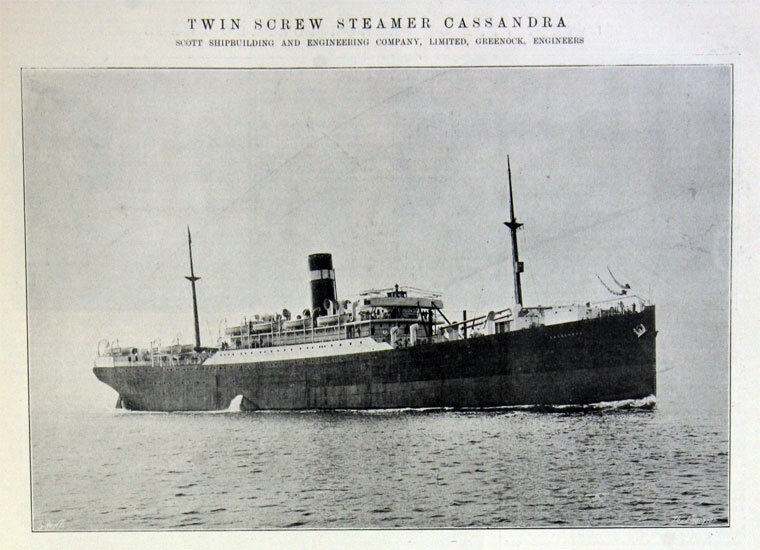 1920s The demand for emigrant and passenger carriers continued apace with the yard making over 30 such ships between 1920 and 1934. WWII The Cartsburn Dockyard only participated in naval construction. It completed three cruisers, twenty destroyers and twelve submarines and a destroyer ship. However, the Head Office was bombed in 1941 and many records were destroyed. A further blow was the destruction of the engine and boiler works: they were out of production for six months. Ships in pre or near production were also damaged, thus delaying completion on a number of projects. 1947/8 The yard was redesigned and modernised and began building merchant ships again. Between 1947 and 1962 the yard made 22 ships ranging from passenger/cargo-liners to mini-liners. 1950s The yard built a series of tankers for Norwegian, British and Greek owners. In the mid 50s, the yard opened a new welding shed, which meant that the size of ships it could deal with increased. This led to the yard fitting out sugar bulk carriers for the Lyle family along with more general bulk-liners and ore carriers. 1960s The yard had been modernised again in the previous two years. It could now construct tankers and bulk carriers up to 40,000 dwt. The yard almost immediately took advantage of its new equipment to build a deep sea ship for the Guinea Government. A number of other similar sized ships followed for other countries. The military also continued to patronise the company with frigates and submarines being made throughout the 60s and 70s. 1961 Shipbuilders and marine engineers. Builders of warships, passenger ships, cargo liners, oil tankers, bulk sugar carriers, ore carriers, steam turbines. 3,000 employees. On 1st April 1966 the Cartsburn yards was merged with the Cartsdyke yard: this meant that there was now one continuous shipyard in the area which had been a long held aim of the Company. 1968 The Geddes Report recommended mergers, and a new company was set up: Scott-Lithgow with two separate operating companies Scotts Shipbuilding Co.(1969) and Lithgows (1969) to run the yards. 1970s The yards continued making huge tankers and naval ships. The yards were nationalised on 1st July 1977, becoming part of British Shipbuilders Corporation but almost immediately began running out of orders, with the last ship launched from Cartsdyke on 8th August 1979 and Cartsburn on 19th February 1980. 1984 The yards were sold to the Trafalgar House Consortium on 28th March. Four years later they were demolished for redevelopment. There is now a set of offices and a roundabout where the Cartsdyke slipways had once been. This page was last edited on 1 March 2019, at 15:45.